We start our journey in the morning by leaving Dahab by Minibus – driving to Wadi Ghazala. 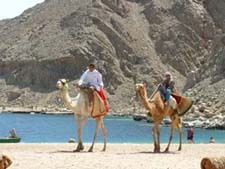 Here we get ourselves & our equipment for the first time on the back of our Camels. Our first ride will lead us to the White Canyon. We climb through the Canyon for about 1½ hours. Directly behind the White Canyon the Oasis of Ain Khudra is awaiting us. 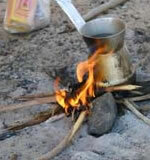 Here, we have time to relax, drink tea, chat with the Bedouins and we will take our lunch with a Bedouin family. After this rest, our Bedouin teacher will give us our first lesson about our Camels: How to order the Camel to sit down, to be able to get onto it. And how to saddle and pack the Camel. How to put the headgear and how to order the Camel trot or gallop. Further our teacher will give us an idea about the Camel’s food and its “social life”. Today our Bedouin teacher will show us all about feeding the Camels. We will know how we can prepare the food and of what it consists. And when do we have to feed and water the Camels - and how. Further, how we can tie the legs of the Camel to leave it resting & eating free in the desert. In case you choose the 2-days-trip, our safari will end here. We will get back to the road, where our minibus is awaiting us in the late afternoon to return back to Dahab. 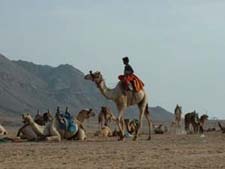 Otherwise, we will enjoy a 1½-hour Camel ride leading us to Jebal Blehis. Here we prepare ourselves again to spend our second night under the stars. The Bedouins will prepare our camp, light a fire and cook fresh dinner for us, before we enjoy the silence and the atmosphere of the desert and the mountains. Today we will learn how to ride a Camel on our own!!! This means, we have to know how we can order the Camel to trot and gallop, and how to lead it in the right direction. How can we make the Camel listen to us? And how do we sit on it in a comfortable way – for us and for the Camel as well. Aim of this Safari is that we can handle the Camel at the end of the trip on our own. 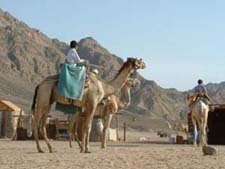 We will know all about leading and feeding, packing and riding the Camel. To give ourselves a chance to approve all we learned during these days with the Bedouins in the desert, we are finally going on a free Camel ride for two hours. At the end of this ride the Bedouins will prepare the last lunch for us in the nature. Feeling relaxed, we make our way back to the road where the minibus is awaiting us in the late afternoon to return back to Dahab. * Minimum 2 pax needed to organize this trip.